Today we were called for area rug cleaning in Dana Point After Water Damage. Not a typical area rug cleaning call we had today in Dana Point. But this rug cleaning is needed after a few rugs have sat in water caused by a burst pipe. So, in essence today we were called for area rug cleaning in Dana Point and water damage restoration for the rugs. It appears that water pipes that ran underneath the house had burst and wate has flooded the beautiful rock looking floors of the Dana Point home. 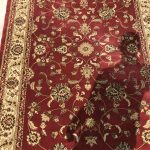 In addition, throughout the house several oriental rugs are spread to create a beautiful artistic and unique look. However, two of the rugs that were laid down in the main area of the living room were not so lucky. They were positioned right where the water chose to flood the home. Therefore, when we arrived to the Dana Point home, the two rugs smelled like meldew. In addition, the two rugs have experienced color bleeding from sitting in the water for too long. 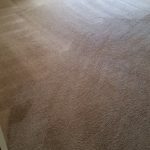 Our exepertise with area rug cleaning in Dana Point. We picked up the rugs and brought them into our facility for dry cleaning and hopefully repair. Yes, we do our best to work on the discoloration of the rug. All of that in order to bring back the rugs back to the customer looking as good as new. 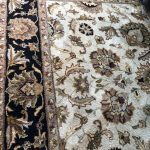 We spent many hours cleaning and repairing the area rugs. We were able to really improve the color bleeding on one of the rugs. 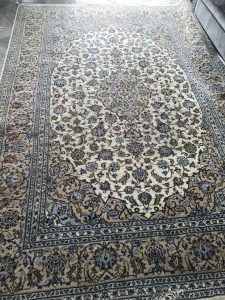 However, the other rug was a bit tougher for us to completely restore.Nevertheless, we thoroughly cleaned the rugs and disinfected them so they do not smell like meldew and grow bacteria. Although this was a tough experience for the customers in Dana Point, Dr. 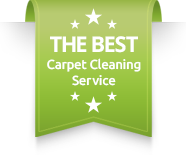 Carpet Irvine is always at your service.For More information about area rug cleaning in Dana Point, please contact Dr. Carpet Irvine.